(L - R) Officers Kaleb Barker, Brandon Brewer, and Tito Reyes at W. Church and the US-59 overpass. Speeding While Carrying Drugs, 2 Local Men Arrested, LIVINGSTON, May 12, 2016 - At approximately 5 pm on May 11, 2016, Officer Tito Reyes with the Livingston Police Department initiated a traffic stop (speeding) on West Church and the US-59 Overpass (near Livingston Whataburger). The car was a black Dodge Intrepid driven by Kelly Karvin Graham, 25, of Livingston. Officer Reyes became suspicious when he spoke with Graham and his passenger, Matthew John King, 28, of Livingston. Graham agreed to let Reyes do a vehicle search. Reyes was soon backed up by Officers Brandon Brewer, Donald Dyson, and Kaleb Barker. The search turned up four small bags of K2 (synthetic marijuana). Both men denied ownership of the banned substance, so both were placed under arrest and charged with possession of a controlled substance. 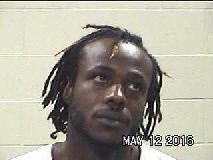 The two were loaded into separate patrol units to be transported to city jail. 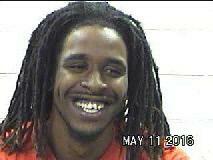 King tried to hide another bag of K2 in the back of the patrol car that he was loaded into. When King arrived at jail, he was found to be in possession of more contraband (a small bag of real marijuana in his shoe). Matthew John King was charged with: Possession of a controlled substance, Tampering with evidence (felony), and possession of marijuana. Graham's vehicle was hauled by Ken's Towing and will be stored at Harrison Body Shop in Livingston. Officer Brandon Brewer speaks with Kelly Graham. Officer Tito Reyes snaps pictures of the contraband (also pictured is Officer Kaleb Barker). Graham's vehicle was towed by Ken's Towing. Houdini stayed in the air conditioned truck.